In 1858, Tapia’s daughter sold the rancho to John Rains and his wife Maria Merced Williams, a wealthy heiress. Two years later the couple hired Ohio brick masons to build them a new home, which today is listed on the National Register of Historic Places and serves as a museum. In 1861, the couple, along with their three children moved into the home that was strategically-located at the confluence of the Mojave Trail, the Old Spanish Trail, the El Camino Real, and the Butterfield Stage Route. By this time, Rains was well recognized as a rich and politically influential man. He was also well-liked and quick to open his home to travelers along the trails. However, the rich and powerful also had enemies and in November, 1862 while Rains was driving his wagon to Los Angeles, he was ambushed near San Dimas. The 33-year old land owner’s body was found 11 days later riddled with bullet holes and hidden in the bushes. His murder was never solved. After Rains death, the rancho began to fail and disputes over water rights became prevalent. 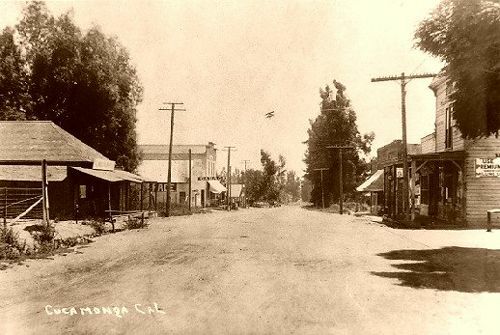 By 1870, the Rancho fell into foreclosure and was sold the following year to a banker named Isaias Hellman and other San Francisco businessmen, who formed the Cucamonga Company. Dona Merced, having remarried, moved with her nearly penniless family to Los Angeles. The Sycamore Inn has been doing business since 1848, Kathy Weiser, December, 2005. Though Hellman formed the Cucamonga Homestead Association to develop the new community, his plans were curtailed because of lack of water. In 1881 a man named Adoph Petch, along with four other investors, opened another track for development just outside of the Rancho lands. Spurred by the competition, Hellman brought in water for his community via water ways dug by Chinese laborers. Irrigation tunnels were continually improved and before long the area was cultivated with citrus, olive, peach, and grape crops. In 1887, the two communities combined to form the city of Loamosa. However, in 1913, when the Pacific Electric Railway came through, the town was once again renamed to Alta Loma. In the meantime, yet another community called Etiwanda had also sprouted up to the east. Having long been a city where trails met, it came as no surprise when Route 66 was added to the list. 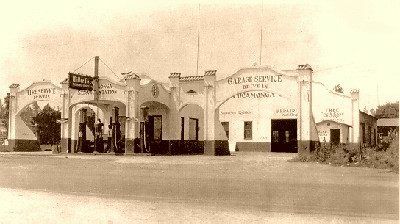 In no time at all the city boasted motels, diners, and tourist shops to serve the many travelers of the Mother Road. Once known for its many vineyards and orange groves, Rancho Cucamonga is today one of the fastest growing suburbs in the metropolitan area. In 1977, the communities of Alta Loma, Cucamonga, and Etiwanda were merged to form the city, which now sports nearly 150,000 people. Though new development have replaced many of the older buildings, the suburb continues to provide numerous peeks of its rich history. Though the vast majority of its agricultural base is gone, the area soil is still very fertile and during various times throughout the year, you may still see produce stands along the side of the road. At the northwest corner of Foothill Boulevard and Haven Avenue sits what was one of California’s oldest wineries — the Virginia Dare. Today, this historic building has been transformed into offices, but still retains its original 1830’s architecture. Nearby, at 10150 Foothill Boulevard you’ll find a place called Route 66 Memories, a classic antique and gift shop housed in a historic three-story farmhouse. Look for the collection of metallic dinosaurs in the front yard, stop, and browse a plethora of items ranging from metal sculpture, rustic mission furniture, hard-to-find items, collectibles, and Route 66 memorabilia. Just a bit further on down Route 66, at the northwest corner of Foothill Boulevard and Archibald sits the Richfield Oil station, or Cucamonga Service Station. 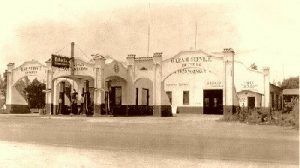 The station opened before the Mother Road in 1915, and served Route 66 travelers until the 1970’s. This place stands out among the more modern views of the road. In January of 2013, Lamar Advertising of Loma Linda, CA donated the land the station sits on to the Route 66 Inland Empire, California Association, who reopened the building in October 2015 as a museum. For more information see their website HERE. Continuing along to Hellman Avenue, look for the New Kansan Motel at 9300 Foothill Boulevard, its name conjuring up memories of mid-westerners escaping during the dust bowl days. On the corner of Vineyard and Foothill sits the old Thomas Winery, the oldest winery in the state. Established in 1839, legend has it that the first owner mysteriously disappeared leaving hidden treasure still undiscovered on the property. The winery, now a California historical landmark, still stands in the building, today called the “Wine Tailor,” along with a coffeehouse and restaurant. The Magic Lamp Inn has been serving customers along Route 66 since 1957, Kathy Weiser, December, 2005. The original 1860’s Rains Home that was once the center of the Rancho Cucamonga has been restored and can be toured at 8810 Hemlock. 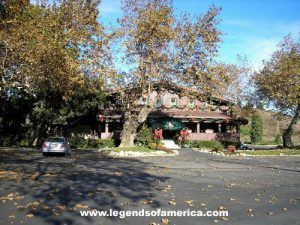 Rancho Cucamonga also sports the historic Sycamore Inn that once stood as a San Bernadino Stage stop. Located at 8318 Foothill Boulevard, this old place has been offering great food and friendly service for almost 150 years. 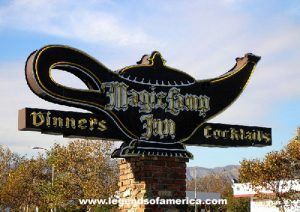 Nearby, at 8189 Foothill Boulevard, is the Magic Lamp Inn, complete with its genie bottle neon sign. Serving Route 66 travelers since 1957, you’ll find continental cuisine inside the dark restaurant where the genie bottle perpetuates itself over and over again. While in Rancho Cucamonga also be sure to visit the Route 66 Visitors Center and Museum at 8916 Foothill Boulevard.